Inder Loves Folk Art: Sailor Girl. Remember how I had ambitious plans to sew a bunch of Christmas presents for the children in my life, but never did? Of course, what I didn't mention then, because it was top-secret, was that I was suffering from the first trimester blahs, which I'm sure many of you can relate to. You know, a little nausea and a whole lot of blah. Early pregnancy is not really compatible with ambitious plans of any variety. I really should have known better; after all, I've been through this once before. So I never did make any of the cute outfits I had planned; instead I issued IOUs to the parents of said children, who were all very understanding, of course. 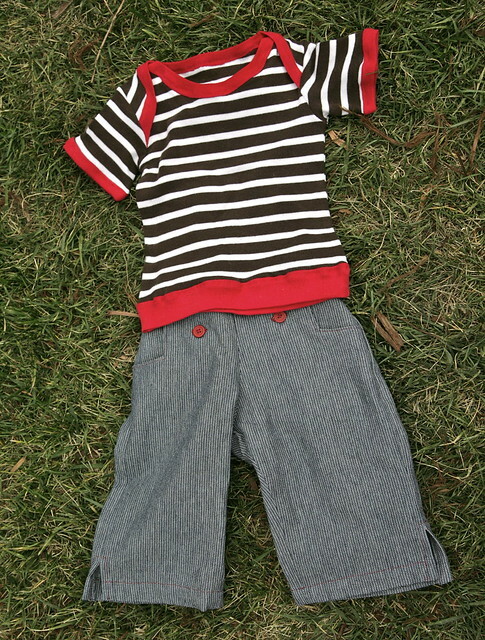 Now that I'm well into the second trimester and feeling a bit more energetic, I've been on a major sewing kick, so I thought it might be fun to finally sew up some outfits for the kiddos. First up, I decided to make a Envelope Tee and Sailboat Pants for my adorable little niece Helen, who is a few months shy of two years old now. 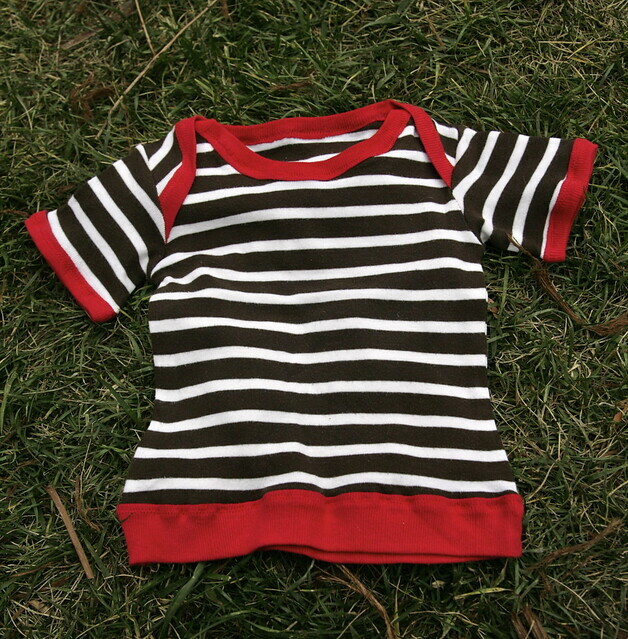 For the envelope tee, I used two old tops that I long ago relegated to the "harvest for fabric" pile: a red ribbed tank, and a brown striped shirt (which was featured in this raglan t-shirt a while back). It went together really easily, although one of these days, I'm going to try using a walking foot to sew knits and see if that helps avoid the stretching I inevitably seem to get when I try to apply ribbing. I am pretty happy with how this red ribbing worked out, though. Awesome bright red will cover a multitude of sewing errors, I find. Using ribbing along the bottom as well as the neckline of the shirt saved me having to do a proper hem, and also added some length to this pattern, which I have found to be a bit short in the larger sizes. Plus, it just needed more red. You know how that goes. Is it just me, or does this top just scream for some denim Oliver + s Sailboat Pants with red buttons and red toptstiching to complete the nautical theme? Yeah, I thought so too. With the pants, though, I ran into a snag. Just as I was ready to make the cute buttonholes on these pants, I realized I had misplaced the buttonhole foot for my nice new machine! Doh! I tore apart my messy sewing corner, to no avail. I had used the foot (and the same fabric) just this past weekend, so hopefully it will turn up, but I'm a little worried that Joe might have picked it up and "put it away" for me, in which case I may never see it again. Well, reader, I had no choice but to pull my old 1970s Singer and crazy space-aged buttonhole attachment from our back room chock-full storage area. As anyone who has seen my sewing corner will immediately attest, I don't have space for two sewing machines. 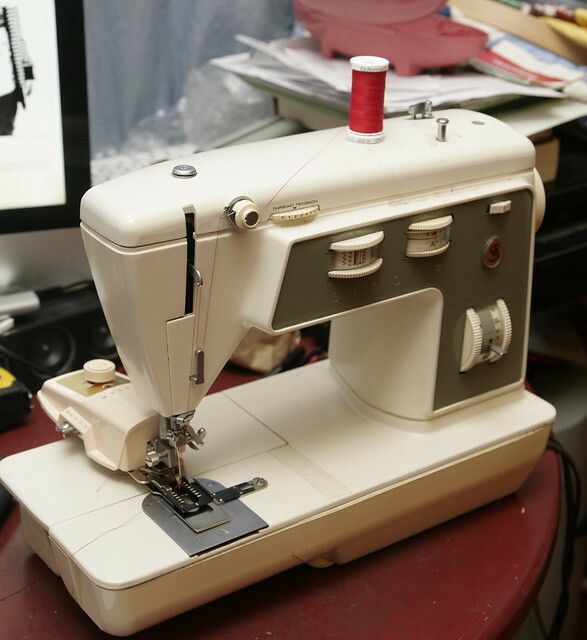 Thus, my husband has been asking me to post my trusty old Singer Stylist on Craigslist and my vintage buttonhole attachments on Ebay ever since I got my new machine, but seriously, I have just been so busy! Really, I can't seem to spare a single minute to work on a listing ... cough cough. Disaster averted, and pants completed. I delivered this outfit to the young recipient this evening, and both items fit well, with a little room to grow, which made me pretty pleased. I counted my machines I have 3 overlockers and 5 sewing machines. I keep them all because they each have a skill that they do well. PS Tell Inder great outfit! Such a cute outfit. I still don't have that pants pattern but it's on my wishlist. I'm such a lazy commenter... I did say congrat's on the baby bump I hope? I read and enjoy all your posts :) Happy Monday! Thanks Crystal! 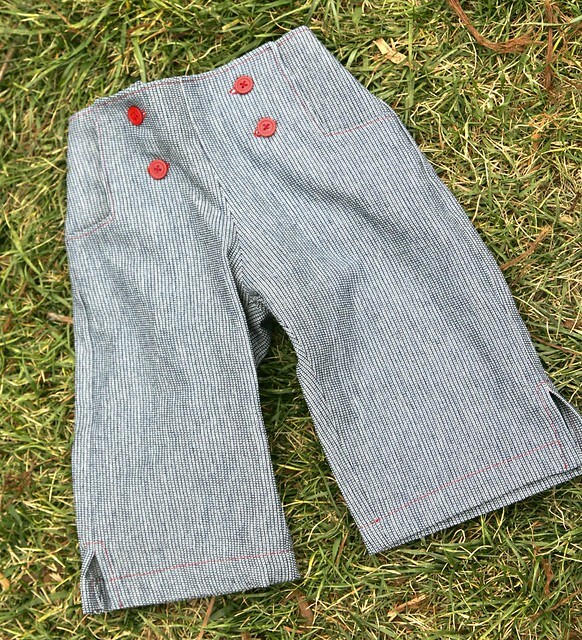 It's a great pattern - you get these cute pants, plus a skirt version, and an adorable sailor-style top. And ditto Nicole's note to your hubby! And to add to the chorus... our 'dining table' is kind of semi-permanently set up with my sewing machine next to my overlocker next to my coverstitch machine. Um, not to mention the other three or four sewing machines stashed in the 'study'. Adorable outfit! I am embarrassed to say I have never done a button hole. I've tried a few times but I always end up with a horrid tangle of threads and a jammed machine... even after it has just been serviced, so it must be something I'm doing. I have a number of project ideas in the wings that stay there because I'd need to know how to make a button hole to do them. But one day I WILL join your club of beautiful button hole makers. You credit your machine, but I suspect you had a thing or two to do with it as well. If you read back through my archives, you'll see that I've struggled mightily with buttonholes as well. My Stylist has a four-step buttonhole that is functional but looks like crap. It wasn't until I found the awesome attachment that I was able to make "beautiful buttonholes." 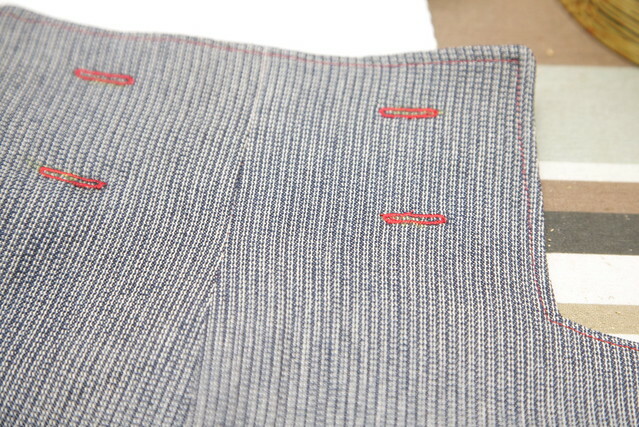 Similarly, my new machine has a buttonhole foot that really grabs the fabric, and it works well too. This is an area where, truly, having the right equipment seems to make a big difference. Keep working at it! Experiment, experiment, experiment. Seriously, those pants are adorable (love the red contrast stitching and buttons...and those beautiful button holes of course) and the shirt with the extra ribbing on the bottom is too cute! I know. I would totally wear this outfit too! Perhaps with a little kerchief at the neck? I think I'm going to be doing the ribbing on the bottom a lot more now that I've seen how good it looks. The longer length is really cute on niece Helen, and it gives her a little more room to grow (she's skinny, but pretty tall for a 21 mo. old). Win/win.